This weekend Tempe, Arizona played host to the Pot of Gold Music Festival and I decided this was good opportunity to warm of for Coachella next month. Pot of Gold was my Music Festival Spring Training. On Friday I was able to see partial sets from Bleachers, AWOLNATION and Bastille but I went primarily to see Future Islands, Girl Talk and Chromeo. If I am being honest, I was really just going to see Future Islands. I was feeling optimistic about the show all day. Future Islands were one of the first bands of the day and scheduled to play from 5:30 to 6:30 PM. This was good news because a) nobody would be going to see the early bands and there would likely be a small crowd at Future Islands and b) sunset would be at 6:25 PM and bands that elicit transcendent emotional experiences are always crush the magic hour. I wasn’t wrong. A small crowd of people gathered at the smaller of the two stages at Tempe Beach park and I was able to walk up within a few feet of the guard rail in front of the stage. Future Islands took the stage and opened with “Back In The Tall Grass”, one of my favorite tracks from their award winning 2014 album Singles. I’d seen the videos online, the classic Letterman performance and written about their music at length but lead singer Samuel Herring is a force of nature and its hard to capture the majesty of this mans stage presence in a YouTube clip. He is interminably confident and strikingly humble. He sings like he is desperately trying to change your mind, like his own existence hinges on his ability to make you understand something through the music. When he isn’t dancing like a maniac teenage pop star, he is pounding his chest, maintaining sustained eye contact with audience members or prophetically reaching towards the sky. It wasn’t music, it was profound theater. Throughout the set, Herring tried to engage the crowd by pointing at the sun, challenging it to a duel and repeating “We’re going to beat the sun. We’re going to bring that thing down.” Its the kind of concert cliche I’ve come to expect after nearly a decade of festival going experiences but on this particular day, with this special little band, I was wholeheartedly moved. His sincerity was startling and his passion so immense, I found myself constantly moved to chills, arm hair raised despite the 90 degree temperatures. In a dispassionate and disconnected world, Future Islands connected me to a moment and a feeling, and I’ve carried it with me in the days since. Apathy is hip and easy, and under different conditions the shameless abandon of Future Islands could be comically insincere or melodramatic. Its refreshing and maybe even shocking to see a band recognize the immeasurable power of a single show and so earnestly try to make it count. Like college seniors in the NCAA tournament, Future Islands perform like total collapse or ultimate redemption might be mere seconds away. Herring beat his chest to the closing notes of the song, howling that final challenge as the sun finally set. 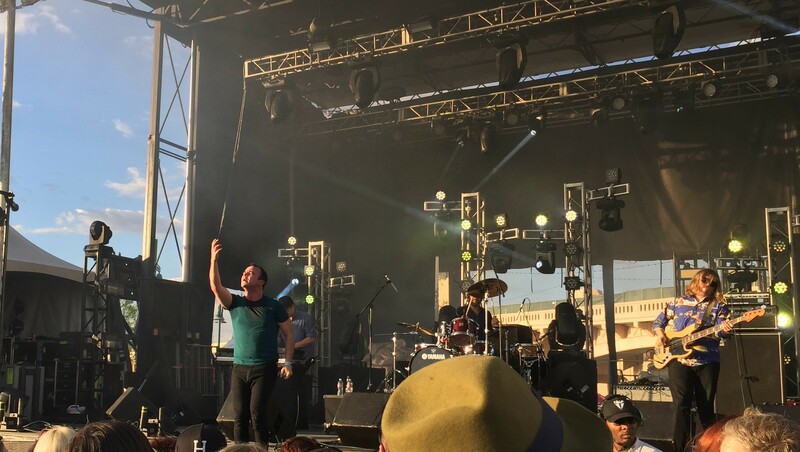 Future Islands sang of beauty, hope and elation in the face of loss and regret. In that moment, I was inspired and present and endlessly optimistic. PS Chromeo and Girl Talk were good too.